AMW Bulletin: Win Passes to Cream Silk Transformation! Cream Silk has always been part of my "hair journey". No matter how many conditioners I've tried, I will definitely use Cream Silk at least once or twice a week because I always have one in my shower rack. It's my "to-go-to" conditioner! Cream Silk, together with the Philippines' top magazines, continues to champion every Filipina's journey of transformation, as they launch Cream Silk Transformations: Spotlight on the Modern Filipinas. It is a glamorous, empowering and inspiring activity-filled event this coming January 23, 2016 and YOU can be part of this journey! 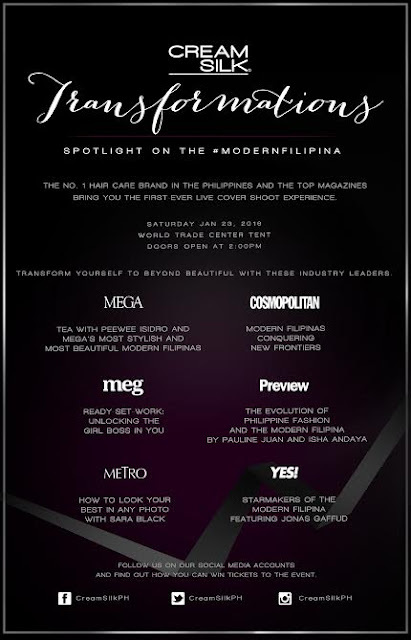 This is a one-day affair held at The World Trade Center tent hosted by MEGA, Preview, Metro, Meg, Yes and Cosmopolitan. Attendees will be able to explore the whole venue and attend a variety of workshops presented by their favorite magazines and experience hair transformations at the Cream Silk Special Booth. So ALL OF US can get the chance to unleash our beauty and become the woman we want to be! Aside from that, Cream Silk will also introduce a strong lineup of Modern Filipinas, women who embody the traits and characteristics of the Modern Filipina to serve as inspiration, each being on the verge of their own transformations. There will be a LIVE cover shoot experience and it is the FIRST time ever! Simply complete this phrase and post on your social media accounts : "This 2016, I will become a #ModernFilipina by ___________ @CreamSilkPh #CreamSilkTransformations"
Cream Silk will be picking 60 lucky winners to attend the event! What fun! I will be dropping by too so I hope to see you there! I love Cream Silk! Good luck to everyone!